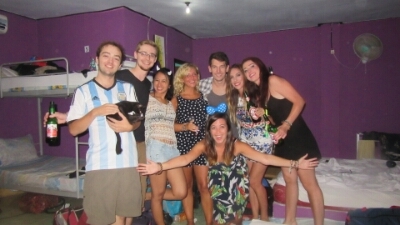 Christmas and New Years in Indonesia – Where's Walton? My flight arrived in Bali on the 22nd December. I had a plan of diving straight to bed as I was still sick with Mono. I had never really heard of Mono before, but it just felt like I had a bad flu that drained me of energy and social capabilities. 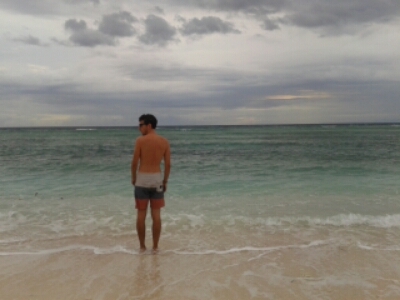 It was a really weird week in Bali and probably the lowest point of my trip so far. Travelling may always look bright and fun in pictures but its still real life and it’s not always so rosy. I’m sorry if my blogs have been depressing lately but I’m just telling it as it is and I had serious thoughts about booking a flight home – I was that miserable, it was a really weird time. I knew being alone at Christmas was always going to be hard, but being alone at Christmas with the mono virus just exaggerated the sad lonely feeling. I’ve definitely learnt never to be away from home at Christmas time again. On Christmas Day I did manage to get out of bed. A Christmas Miracle! I started off my day in the most idiotic way, I put on the film The Impossible. A film about the Tsunami… not the most uplifting film to choose at Christmas, especially on an island. So I switched off and headed down to the BBQ that was taking place at my hostel combined with another hostel down the road. 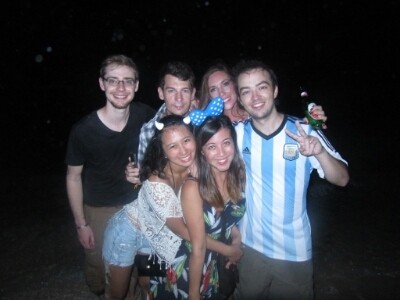 There were some really nice people at this… I made a good little friend called Vic, 19 from Singapore. He was shocked that I hadn’t seen the beach yet so offered to take me to see the sunset at Echo Beach on the back of his moped. I found out that Vic had only learnt how to ride a scooter a few days before so when he attached a massive surf board to the side of the bike, I did begin to panic and rightly so because at one point we rolled backwards down a hill. 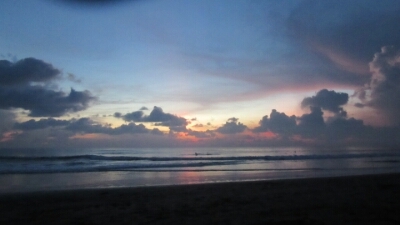 It was fine though, and as Vic surfed I watched an incredible sunset. 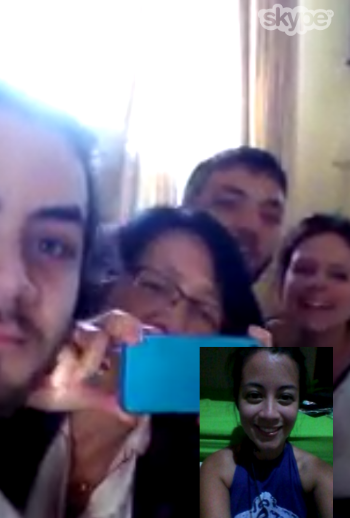 After that I was straight back to my room to Skype the family and a few friends. It was emotional. The next few days I just slept and tried to slowly start eating again. Sorry…nothing exciting but I did see Vic a few more times and also more people were joining me for my movie afternoons. On Sunday 28th December I woke up to the devastating news of the Air Asia flight that had gone missing. Myself and the other people at my hostel took the news really hard because it was very close to where we were and was also the flight that Vic would be on the next day. It was also an airline I and so many people I know have flown with all through Asia. My thoughts go out to the families of all of those on the flight. 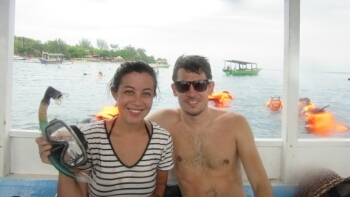 On the journey to Gili T I met two Americans, James (Michael Jackson eyes) from Boston and Michael from Buffalo, New York. 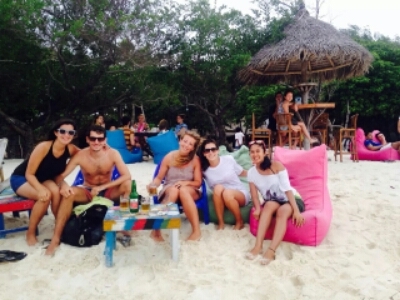 These guys are teachers in Indonesia and were taking a vacation to Gili for New Year’s. 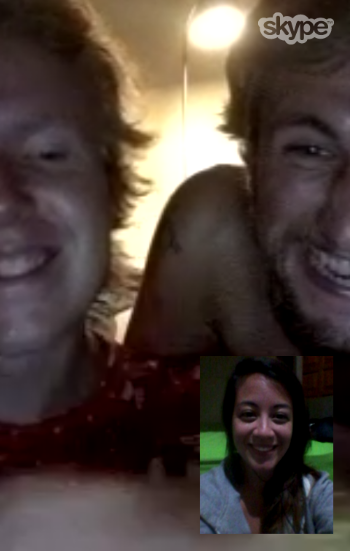 Really nice guys!! 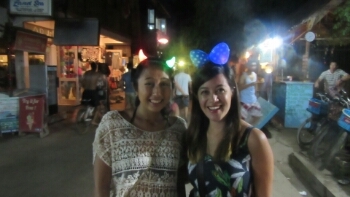 They were heading over to Gili Air but they’d be back for New Years! 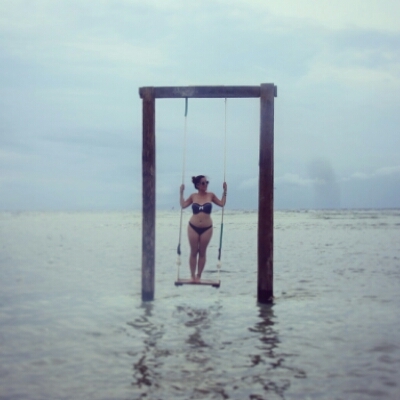 Gili Trawagan was actually a really lovely place – I had low expectations after hearing it was an expensive party island but the same with any island I’ve learned that if you’re willing to explore you find some real hidden beaches and I actually really loved the place. 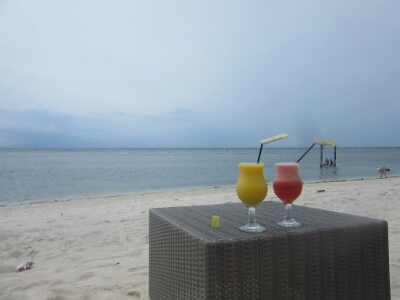 If you go to Gili Trawagan I highly recommend Cafe Kayu… I ate there nearly everyday while I was here. Good cake, coffee and English Muffins with ham, egg and CHEESE. The doctor did advise me to eat more western food. The view was pretty outstanding too. At night there’s countless restaurants to choose from but if you want cheaper food, the night market is good for Indonesian food and if you want cheaper food go for the restaurants behind the main strip. 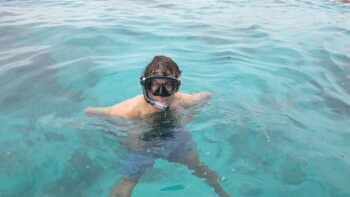 On New Years eve during the day Steven and I did a fun snorkeling trip around Gili T and I got to swim with real turtles which was incredible! 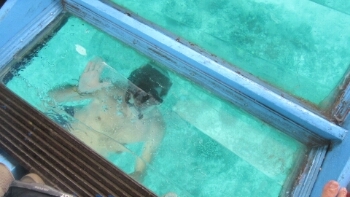 I even fed some tropical fish some bread out of my hand – so amazing! 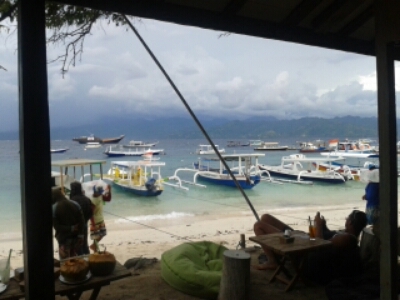 We also Gili Air for lunch as part of the trip and sailed around Gili Meno. Headbands that light up? Yes!!! The following day Steven and I had the best breakfast around midday… pizza! At this point we met two new friends Luisa from Brazil and Gill from England! A day at the beach was just what we needed after the late night before. Our hostel owner recommended a beach about 45 minutes walk away… but totally worth it. The beach was next to a swanky hotel, who sadly didn’t let outsiders use the pool, but if you bought a drink you could use a giant bean bag on the beach. Yes!!! This is where we stayed for the day. On the walk back we stopped by a place called The Exile to watch the sunset, a tradition Luisa and Gill had been doing since they came to the island. Apparently it has the best view point. Sadly the sun was hiding behind the clouds so there was no amazing views but amazing company. We learnt a few Brazilian traditions from Luisa…. 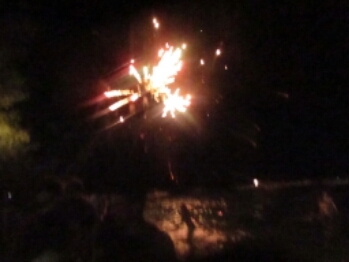 on New Years at the beach you jump over seven waves each time making a wish for the New Year. We all did this! 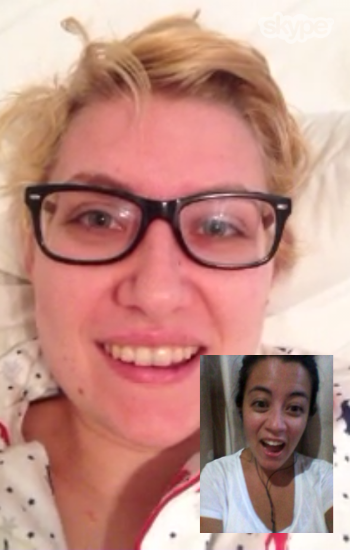 Also she told me another tradition in Brazil is wearing white and buying new underwear. The colour of the underwear is determined by what you want in the new year… e.g Red is love, green is hope. I’m going to Google the rest and attempt this for NYE 2015. So Christmas might have been disappointing but I’m finally feeling back to my old self and excited for the New Year and the remaining 4 months of travel! I don’t have any resolutions but I am going to be more positive and try to remember the reasons why I’m travelling and appreciate that I’m here, meeting fantastic people, eating amazing new foods and NOT working. I’m so lucky to be doing what I’m doing! !